Program: To create a mixed-use neighborhood with a distinctive “sense of place” that is compatible with the surrounding residential areas and commercial areas. The proposal refers in scale and urban spaces to the neighborhoods developed at the end of the nineteenth century. These neighborhoods usually were located outside the city center and included green spaces and tree lined streets. The proposed neighborhood includes a network of prototypical urban spaces such as boulevards, squares and a neighborhood park. The hierarchical street network is comprised by two boulevards and local streets that connect to the existing transportation network. 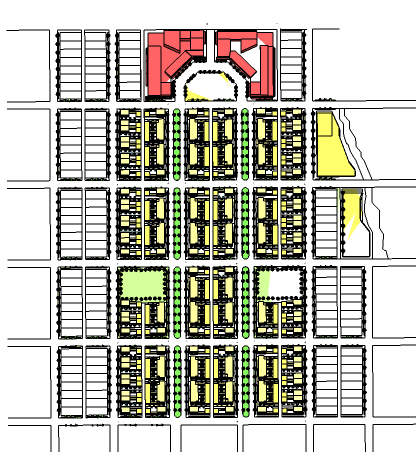 The site plan can accommodate different units types in order to satisfy future market demand. Design proposal: The intention is to include a mix of housing alternatives within a regulating plan that can include residents with different housing needs in terms of size and cost. The Development Standards include requirements that address minimum and maximum building heights, minimum and maximum setbacks, maximum number of units that can be developed on each lot, and regulations regarding facades transparency. For example, minimum building height is 30 feet and maximum building height is 50 feet. The intention is to have buildings of a scale necessary to define the prototypical urban spaces. The residential units are allowed to have a work space area based on maximum percentage per each unit. Off street parking is located on the back of the lots and is accessible by mid blocks alleys. The mixed use area located adjacent to the neighborhood park is required to include small commercial uses and can also include residential units. It is expected the proposal will be developed by different builders. The architectural language is expected to be eclectic and can include designs with historic and contemporary references. The proposal comprise 33 acres, 200 lots for residential uses and approximately 3 acres of mixed use development. The minimum lot size is 40 feet by 100 feet and the maximum lot size is 120 feet by 100 feet.